AUBURN, Ala. – Sightings of coral snakes are normally rare because they generally live underground in loose soils. People could see more of these snakes because of the damage from Hurricane Michael which disturbed some areas of soil. The eastern coral snake tops the chart as the most venomous snake in Alabama. While not as well-known as other venomous snakes, the coral snake has the most toxic venom of any snake native to the U.S. In Alabama, coral snakes range through the southern part of the state. When bitten, the neurotoxins in the venom can cause a variety of symptoms including muscle weakness and paralysis, as well as difficulty speaking, swallowing and breathing. Dr. Jim Armstrong, an Alabama Extension wildlife specialist, said coral snakes are often wrongly identified as other nonvenomous snakes. While rare, bites from coral snakes often happen because the snake was mistakenly identified as a nonvenomous snake. Armstrong said that the look and demeanor of a coral snake can also play a role in mistaking it as a non venomous snake. Armstrong says it is never a good idea to pick up or mess with any snake, venomous or nonvenomous. When identifying the coral snake, Armstrong says there is a common saying that can help people remember the difference between it and the non venomous look-a-likes. Armstrong likes to add “black on snout, better look out” to help the public further identify the coral snake. 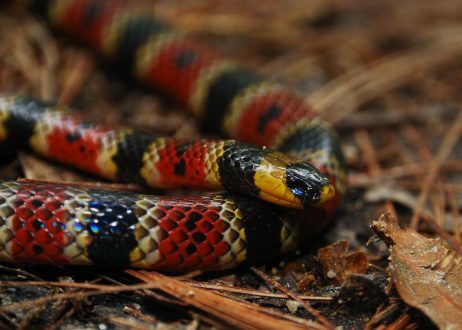 For more information on the coral snake and other snakes of Alabama, visit Alabama Extension online or contact your county Extension office. Outdoor Alabama, the official website of the Alabama Department of Conservation and Natural Resources, is another information source.